Signing of the Free President Nasheed petition took place in multiple locations around Male’ today. 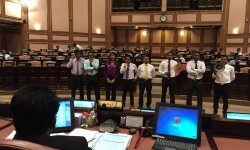 The ruling Party have scheduled a vote today on an amendment to the Judges and Parole Act, which would effectively strip President Nasheed of his Party membership. 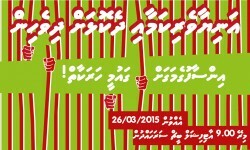 Join us in front of the Parliament on 30/3 at 12:30pm to protest against this violation of our rights. 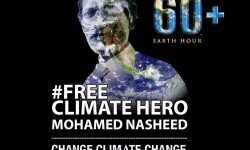 Climate hero, President Mohamed Nasheed remains under arrest, and the Government have suddenly cancelled activities to mark #EarthHour citing security reasons. The Government may be afraid of the dark, but we’re not. Come join our march! From in front of the Social Centre at 8pm. 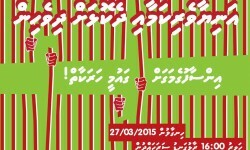 Opposition Parties who stand against tyranny will hold a march in Male’ on 27 March 2015 at 4pm from the Raalhugandu area. Would your children like to send #WishesForRaeesNasheed? Come by Raalhugandu on 25 March 2015 from 4.30 – 6.00 pm and handover their cards to President Nasheed’s family.